Dave Winer and I hung out tonight and went to dinner together. We started out from my house in Montlake and walked through the university to Aladdin Gyro's up north of 45th on the Ave. We were going to go to Thai Tom but the line was too long. We talked about Google, Microsoft and the industry as a whole. Tip jars, Bush and how I should never expect to get social security (I already knew this). He's a good guy who likes to shake things up. 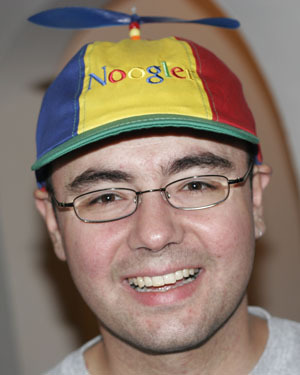 Since everyone wanted to see me wearing my Noogler hat, I had him snap a quick picture with my new Canon 20D. I also grabbed a picture of him. We are both looking a little worse for wear from the long walk up there and back. If you really want to chew up some of my bandwidth (I may have to take this down) you can grab the original files (~2MB each) of me and Dave. These are jpgs right out the camera. Be warned that they are shot in the AdobeRGB color space so you should really view them in a color space aware application (something more like Photoshop and not IE).